Should NCAA athletes receive compensation? I only see one reasonable answer to the issue of student compensation, pay the athletes, but not all of them. Paying a superstar and the back up offensive linemen the same amount would be ridiculous. But I believe that all athletes should receive compensation, whether it be something as small as free food, that can go a long way. In cases like Shabazz Napier and Johnny Manziel, where they are icons, I believe they should be allowed to have endorsements, and they should get paid a percentage on their own jersey sales. That way hard work still pays off, athletes will never go to bed hungry since the NCAA is providing them with food, and student athletes will stay in college for a longer period of time and still be able to provide for themselves and their family. All the money that these student athletes bring in to their program is great, everyone benefits from it, except the athletes. Every night hundreds of college athletes don’t have enough money to provide the most basic necessities for themselves if the school does not provide. 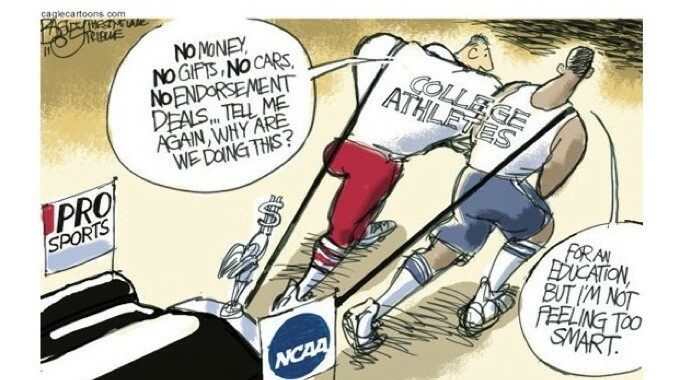 NCAA Student Athletes should be compensated with money for the income that the school makes off of them. Revenue chart of the NCAA in 2008. ESPN has not done another revenue chart since 2008 due to the uproar of the community. The Michigan Wolverines recruiting class of 1991 tried to fight back on this issue. Five Michigan basketball recruits were coming known as the best recruiting class in the nation. There was so much hype surrounding them as high school athletes, one would hardly call them amateurs, and the fame multiplied once they got to college. They realized that they were getting exploited by the NCAA and tried to take a stand. The 5 of them started to realize how many people were paying for and wearing their jerseys, how packed the arena was every night, and how young children would idolize them and try as best they can to dress like them. So they took a stand, they stopped wearing any Michigan Wolverine clothing, they warmed up in plain black t-shirts. They played in black socks, and wore generic all black or white basketball shoes. Instantly they become public enemy number 1.